조선 말 고종황제(재위 1863∼1907)이 착용 것으로 전해지는 갓이다. 이 갓은 고종이 썼다고 전해지는 점과 만든 기법이 정교한 것으로 미루어 진사립으로 보인다. 진사립은 왕이나 높은 벼슬에 있던 사람들만 쓰던 갓으로 머리카락보다 더 가는 죽사(竹絲)를 재료로 하여 대우와 갓의 챙부분을 네겹으로 엮고 그 위에 중국산 촉사를 한올 한올 입혀 옻칠한 것으로 제일 좋은 제품이다. 임금이 쓰는 갓에는 대우 아래에 중국산 실을 물들여 꼰 붉은 실을 돌린다. 갓의 꼭대기부분에는 날개를 활짝 펴고 중앙을 향하여 있는 네 마리의 박쥐무늬와 네 개의 구름무늬가 섞여 있는데, 무늬는 전체적으로 큰 편이어서 모자의 윗부분을 거의 채우고 있다. 갓끈으로는 호박의 한가지로 누른 빛을 띠는 밀화를 사용하였다. 구슬처럼 둥근 모양의 것과 봉처럼 긴 것을 교대로 꿰어 만들고 중앙에는 원통을 납작하게 자른 것 같은 모양의 밀화 덩어리를 배치하였다. 박쥐무늬와 구름무늬는 왕의 신분을 알려주는 문양이라고 하며, 갓의 꼭대기부분과 은각부분에 이 문양이 섞여 있는 것이 이 갓의 특징이다. 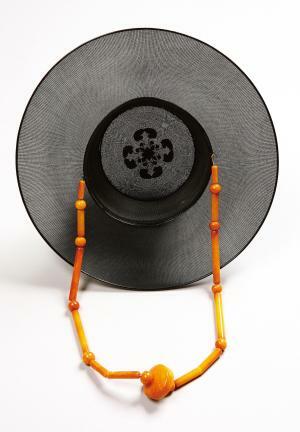 This Korean traditional hat is presumed to have been worn by King Gojong (r. 1863-1907) during the late Joseon. It is especially called jinsarip because King Gojong put on this hat, and it was made with very sophisticated skills. 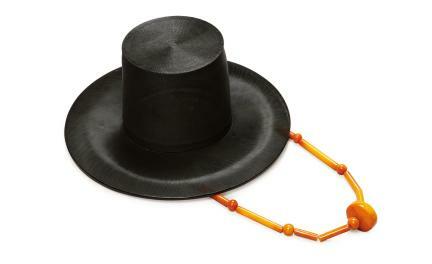 Jinsarip is a hat that only the King or high-ranking government officials could wear. It was made of fine bamboo thread finer than hair, so it is the best product of its kind. The hat has four woven folds, and Chinese silk was put strand by strand and subsequently lacquered. Put under the King’s hat were red threads that were dyed and twisted with Chinese threads. At the apex of the hat are designs of four bats with wings spread and four clouds. The design is rather large, so it fills most of the upper part. 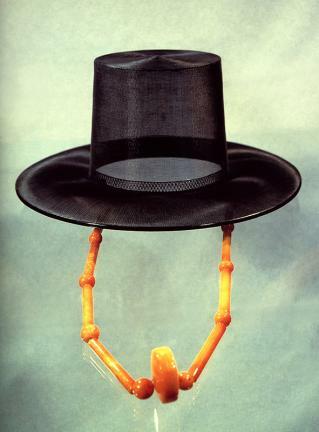 Yellow amber was used as chinstraps of this Korean hat. The round-shaped beads and long baton-shaped beads are woven alternately, with amber lumps cut in flat, cylindrical shapes subsequently placed at the center. The hat has a design of bat and cloud, symbolizing the King.